It's all part of an initiative to highlight all of the great people who come together in our district, and we would love to have your team participate as well. Fill our the form below, or drop us an email at media@tusd1.org to get the ball rolling on your team or nominate a team you see doing great things. 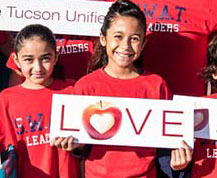 What is your affiliation with Tucson Unified School District? If you selected "other," please describe your affiliation. Is this a Tucson Unified team? If it's not a Tucson Unified team, please describe the team's partnership with the district. How many people make up this team? Why are you nominating this team to be featured? Who should we contact from the team?